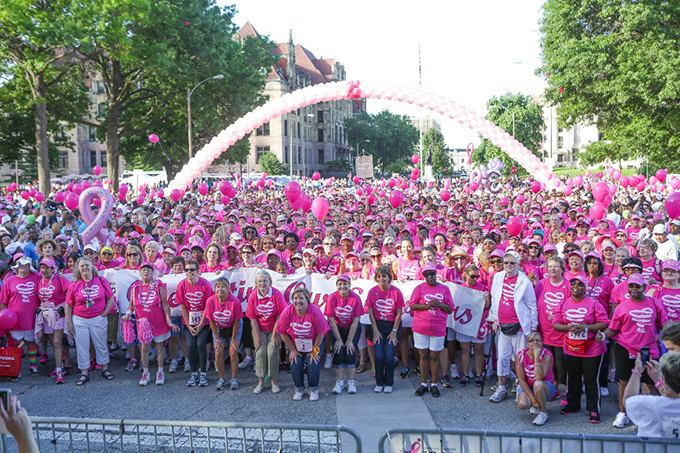 Large crowds like this at a recent race turn out to raise funds for breast cancer treatment. Hundreds of participants will take part in the 19th annual Susan G. Komen Race for the Cure Oct. 8 in Murrieta to raise money for breast cancer research and treatment. Wearing pink T-shirts, entrants will compete in a 5K walk and 5K run beginning at Town Square Park. Registration is scheduled for 6:30 a.m. A one-mile Fun Walk-Run begins at 7:15 a.m., followed by a Survivor and Forever Fighter Ceremony at 8 a.m., the 5K run at 8:45 a.m. and the 5K run at 9 a.m. An expo will also take place from 6:30 a.m. to noon. Susan G. Komen Inland Empire donates up to 75 percent of the afilliates' net income to funding grants that provide breast health education and breast cancer screening, diagnostic services and treatment in local communities. The organization's main office is in Temecula. For information on the event or to make a donation, visit the Susan G. Komen Inland Empire website here.